Back into the office after a three week(!) break. Just going through the email. Spotted the following on the SEDA list and through them worth a mention. Useful for new and experienced academic staff alike. 1. Preparing to teach An introduction to effective teaching in higher education by Graham Gibbs and Trevor Habeshaw now online. Could our students demand we teach courses we don’t already? Student: I enjoyed your lecture today. I find Africa fascinating. Lecturer: Thank you. I’m glad you enjoyed it. Lecturer: Er we don’t offer a course in that here. Student: I think we should make the university set up an African Studies course. Student: If they didn’t listen we could have sit-ins and protest to the Vice-Chancellor and get the local papers in. As far as I know this never happens in the UK. Students here select their subject of study on their UCAS form prior to arrival. Some universities will allow students to change course during or at the end of the first year. Students will protest if a university attempts to close down a department or a programme, but a protest aimed at getting the university to offer courses it doesn’t already teach or have the staff for? No way! But at the US universities in Mikaila Mariel Lemonik Arthur’s book, Student Activism and Curricular Change in Higher Education this is precisely what has happened as students have sort to pressure senior management to set up courses in Asian-American Studies, Women’s Studies and Queer Studies. When I began to read the book for review in Innovations in Education and Teaching International I was somewhat intrigued by this form of protest (the book opens with an account of students getting arrested for occupying the administrative building at the University of Texas). The differences between US and British universities cannot be addressed in anything as short as a blog post. But whilst I have difficultly foreseeing these sorts of campaigns in British universities, I think that there is an interesting point here. For students unable to ‘go away’ for university many subjects are not available to them. For example students in many areas of England are unable to access a languages degree in their own Travel To Work Area (TTWA) or even in the next one. Students who live in the Welsh borders, parts of Lincolnshire, parts of Cornwall, Devon, Somerset and Dorset and parts of North-East and North-West England are not within two TTWAs of a university which offers language degrees. I expect similar patterns would emerge for other subjects. Could students in the UK start lobbying for the provision of new courses in their university or locality? Mikaila Mariel Lemonik Arthur, Student Activism and Curricular Change in Higher Education (Ashgate, 2011). Should we standardise language course titles? Suppose you have just completed French Level 4. What standard are you at? Can you ask for directions, read L’Étranger, conjugate the pluperfect subjective, book a hotel room, express your thoughts on the Arab Spring, recognise the past historic tense, or discuss Molière on French TV? It depends of course. In my most recent report of ‘non-specialist’ language learners (in other words, those not doing a degree in languages – I’m not really sure about the term), I asked learners to provide me with the exact title of their course. I then mapped their answers to the standard they said they should have reached by the end of the course. 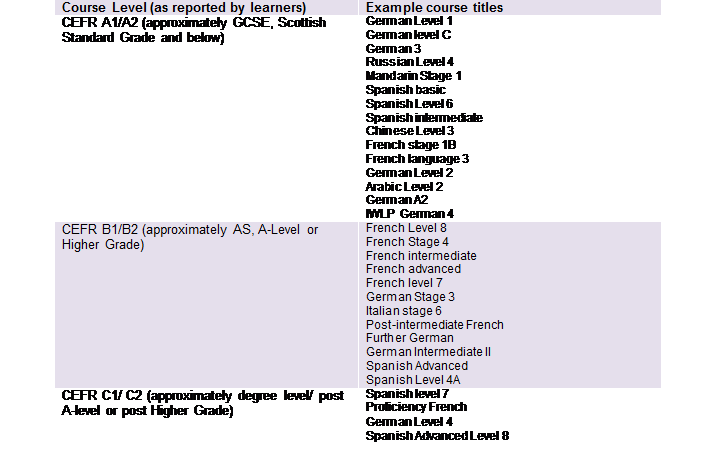 What I found was that Level/Stage 4 courses appear at all three levels to which I mapped the course titles.We have a Level 6 at A1/A2, a Level 8 at B1/B2, a Level 4 at C1/C2 showing just how every institution has its own system. Thinking radically for a moment, why don’t we standardise our course titles? Learners would be able to continue their language learning at another institution (e.g. if they got a job in another part of the country or wanted to continue studying at a higher level not available at their current university). We would be able to collect better data cross-institutional on the language abilities of ‘non-specialist’ language learners. Students might be less worried about whether a certain level of course was too easy or too difficult for them. We could have a national recognised standard for all language learners (you could argue that we could achieve this simply by putting CEFR levels into every course title). A defence of the current unstandardised system would be most welcome! Craig Mahoney’s call for a Higher Education Teaching ‘license’ predictably polarises opinion. Any article in THE about ‘training’ (don’t like the word) for teachers in higher education inevitably leads to comments along the lines of “I haven’t had any training and I get great evaluations for my modules”. I have mixed feelings about Mahoney’s call. As an undergraduate and postgraduate student I had many great teachers, the vast majority (or possibly none) of whom had ever done any training in how to teach. Their lectures were interesting, even inspiring. They encouraged me to think for myself about the material. They asked interesting questions and challenged conventional wisdom. Sure, there were a few who were a bit boring but I never believed that teaching in higher education was broken and in need of fixing. Nothing I’ve seen, read or heard in eight-and-a-half years working for a subject centre has ever led me to seriously revise this opinion. On the other hand it seems right that people who teach should have some sort of support as they embark on their academic career. Perhaps the students deserve to know that their lecturer is a ‘fit and proper’ person to teach just as one needs to be a fit and proper person to run a minicab firm, a football club or a multinational media company – OK bad analogy—or that their lecturer is competent to teach just as a person who passes their driving test is competent to drive. No doubt when the driving test was introduced there were those who said “I’m a good driver and never had to take any lessons or a test—all my friends and family think I am a good driver”. On the other hand we all know that the driving test has not eliminated poor driving. And whilst there are claims that public exams are ‘dumbing down’ the driving test only gets longer and more difficult. Along with their warnings about not going under a car supported only by a jack and not changing a tyre in the fast lane of the M1, the Haynes car manuals have a section in the front about advanced driving. To paraphrase, those who learn by experience react to problem situations when they arise often depending on the quality of their ABS brakes. However, the advanced driver will avoid getting into the problem situations in the first place. The ‘experience-led’ driver may see themselves (and be seen by others) as a good driver and be accident free, but the advanced driver will foresee problem situations before they have the opportunity to arise. I think the advanced driving metaphor is really what learning to teach in higher education is about. I find it impossible to believe that good (notice I say good) courses about teaching in higher education can be anything other than a good thing. However, licensing will not prevent poor teaching any more that driving tests prevent poor driving. Most of those who learn to teach by experience will probably not be ‘found out’, but when the syllabi change, students expectations change or leadership change the experience-led teacher will be unprepared and stressed out. However the thoughtful the lecturer who invests his or her time in becoming an advanced teacher through thoughtful reflection on teaching, reading about teaching and continuing to learn about teaching will be a good teacher whatever the difficult situations arise in the future. I find proofreading difficult, especially proofreading my own work. I’ve long taken the view that proofreading my own work is beyond my abilities, particularly when a manuscript has gone through multiple drafts. Friends and colleagues generally concur; “You’re too close the text” they sometimes say. I’m always grateful for the professionals who perform this service on my journal articles. Such services offer some analysis of issues of style, grammar or rhetorical organisation that students should be aware of and attempt to resolve in their own writing, but they do not provide a ‘clean’ copy or ‘proof’ that the student can immediately submit for assessment (p. 427). Is proofreading is a skill which all students should acquire— particularly students whose first language is not English? Is it part of learning to write well? There is an ambiguity between teaching writing skills and proofreading. There is a moral question about whether getting someone to read an assessed paper is unfair. And is there an ethical difference between asking a friend to read your work and paying a professional (or non-professional) proof-reader? Will a proof-reader ‘just’ improve the writing or will they also improve the content of the text? At what point does using a proof-reader become cheating? What is being accessed—the writing or the content? Is it possible to even separate writing style from content? Does use/ overreliance on a proof-reader lead to lower standards? Does it prevent the students from learning how to write well? Joan Turner, “Rewriting writing in higher education: the contested spaces of proofreading,” Studies in Higher Education 36, no. 4 (2011): 427-440. What is innovation in higher education? I enjoyed Karen Smith’s article in Teaching in Higher Education exploring innovation in higher education. Smith addresses innovation in a university-wide context as well as the individual context. She draws on Kanter’s metaphor of innovation being like flowers. Of course some of those flowers turn out to be weeds. “We are learning slowly as we teach over the years” is the last thing I wrote in my notebook at the “Teaching the Green Humanities” workshop on Wednesday. I can’t remember exactly who said it or even whether I wrote it down exactly as it was expressed, but it was said during the final panel with the workshop speakers. The second last thing I wrote down was “Slowness as virtue”. Six years after taking on the Education for Sustainable Development brief for LLAS I am still learning and still learning very slowly. I’m not able to do justice to the ground which was covered during the event, but a few things will stick in my mind. Arran Stibbe’s reminder (or was it a revelation) that “more sustainable” planet is still unsustainable will stick with me. I need to ponder Greg Garrard’s suggestion that the philosophy of ecology might be a good potential bridge between humanities and the sciences—sometimes it really does “just depend” and the ‘unlaw like’ nature of philosophy may allow this possibility (I hope I’m not mis-representing Greg here in any way). Jessica Frye’s discussion of engaging EFL students (mainly scientists and engineers in her case) through reading eco-poetry demonstrates the potential to teach about environmental issues in a context where many would not think it possible. You are currently browsing the archives for the learning category. I am Senior Academic Coordinator at the Higher Education Academy Subject Centre for Languages, Linguistics and Area Studies (LLAS), based at the University of Southampton. This is my personal website where I share my own thoughts on matters relating to teaching and learning in higher education. I have launched a new website! The UK Citizenship test: Making sure that all new citizens have a good short term memory. The case for open access to research and the problem of reputation. NSS: What does “The course has helped me to present myself with confidence” mean?